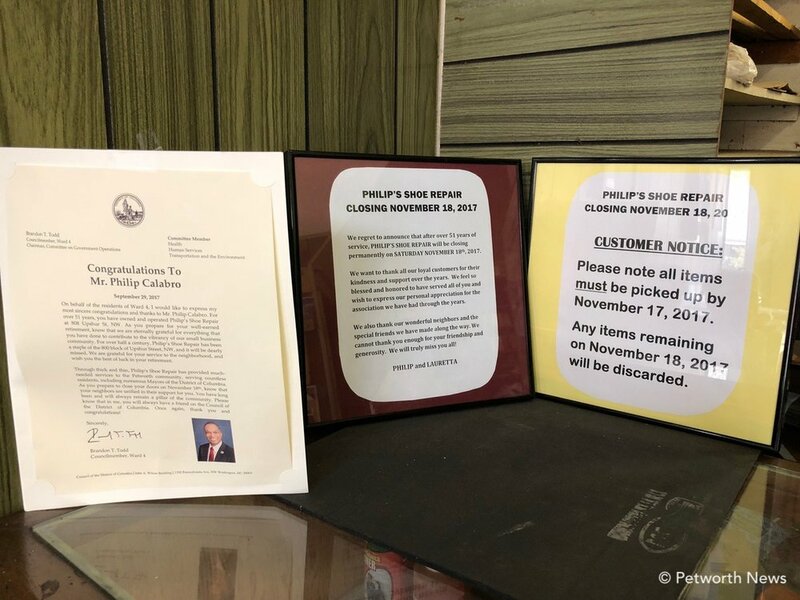 After almost six decades on Upshur Street, Philip’s Shoe Repair is closing its doors as the owner, Philip Calabro is retiring. The last day for the store is November 18th. It's been a great run for this beloved repair shop, with residents talking on the local listservs for weeks about how Philips is their go-to place for fixing their shoes, jackets, dresses and more. It'll be very missed. Mayor Muriel Bowser, Councilmember Brandon Todd and the Petworth Action Committee are throwing him a party from 11:30am - 1pm on Saturday, November 11th, and plan to present Philip with a Ceremonial Resolution recognizing his contributions to the community at the goodbye party at the store (808 Upshur Street NW). The shoe repair store opened in 1924, and Philip started working there in 1966, taking ownership three years later in 1969. His wife, Lauretta, has also been a staple at the store, greeting customers as they came in for a repair of their favorite leather jacket or pair of shoes. "I came around the store before," Lauretta said, talking to Philip, "But I didn't stay here with you all the time until ten years or so ago!" With the closure of Kilroy's Cleaners (to be replaced by condos), what's next for the Philip's building at 808 Upshur St isn't yet clear. The building has been sold, though Philip said he didn't know the plans for it, saying his lawyer took care of all the details. "It was too much, he didn't want to deal with it," Lauretta said "So we asked the lawyer to sell it." Many have said they hope to see more retail come to Upshur Street, and not see just more condos and restaurants. "Restaurants are great, but people also want places to go to get things done," said one resident I spoke to on Upshur who didn't want her name used. "Places like Philip's and Kilroy's will be missed." After the Philip's closes on the 18th, Philip said they plan on taking some well-deserved rest. They won't be far away, Lauretta said. They live just 8 miles from Petworth. If you have any items at the store for repair, you better pick them up by November 17th! Stop by on Saturday at 11:30am to give your regards to this Petworth icon!